My Razer Huntsman will sometimes repeat key strokes or key strokes will get stuck / spam. Ensure your wrist rest is properly aligned and secured to your keyboard. Please remove the wrist rest, re-align the wrist rest and reconnect it. Next ensure the under-glow lighting is working correctly. If not properly attached to your keyboard the under-glow may not light up correctly and you may experience issues with key strokes. Is the Razer Huntsman supported by Synapse 3? 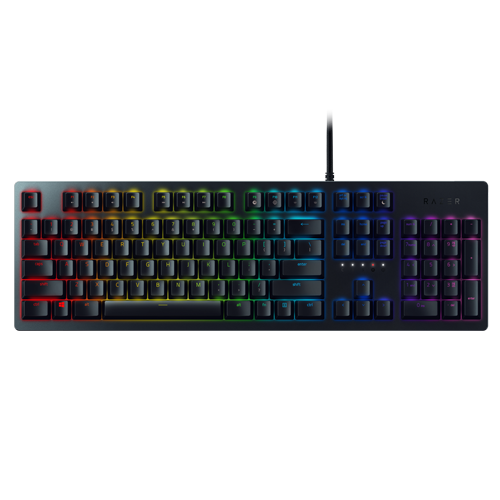 What switch type is used in Razer Huntsman Keyboards ? The Huntsman uses the new Razer Opto-Mechanical™ switch. What’s the difference between Razer Opto-Mechanical™ switches and Razer Mechanical Switches? The opto-mechanical switch uses optical light technology for the actuation. The benefits of the new design is faster switch performance and a longer life span of up to 100 million clicks. What are the technical specifications for the Razer Opto-Mechanical switch? What regional layouts are available for the Razer Huntsman keyboards? The Huntsman comes in US, UK, German, Nordic, French, Traditional Chinese, Thai, Korean, Japanese, Russian, Italian, Swiss, Spanish, Greek, Turkish and Portuguese. The Huntsman Elite only comes in US, UK, German, French, Spanish, Nordic and Japanese. Is the Razer Huntsman a USB-3.1 keyboard? No, the keyboard requires two USB 2.0 ports. Does the Razer Huntsman keyboard have on-board memory? Yes, the keyboard comes with Hybrid On-Board Memory and Cloud Storage. This means you can store 5 profiles directly on your keyboard so that you get your personalized settings anytime, anywhere. What are the differences between the Razer Huntsman and Huntsman Elite? How can I set the preferred media player? The media keys work when a media player is running or in the background. The media player keys will execute the assigned function of the corresponding media player that is active on your computer. Make sure that USB ports are not in hibernation mode. Please go to your Windows “Device Manager” and click the + sign next to Universal Serial Bus Controllers. Click the Power Management tab and ensure that “Allow computer to turn off this device to save power” and proceed to do this under each Root Hub. If you are experiencing issues with the Razer device in a particular application, test the device in another application to confirm if the issue is specific to that application. If the Razer device functions properly in another application, then the program is likely the cause of the issue. Please feel free to contact customer support to report the issue and see if there are any fixes or workarounds for the issue.